Five hundred years ago, the Reformers were defending doctrines such as justification by faith alone, the authority of Scripture, and God’s grace in salvation—some to the point of death. Many of these same essential doctrines are still being challenged today, and there has never been a more crucial time to hold fast to the enduring truth of Scripture. Dr. Barrett has gathered a full stable of blue-ribbon theologians for this winning volume. All the essays are carefully contextualized, the Reformers judiciously selected, and the bibliographies thoughtfully assembled. Some chapters are especially notable for the breadth and depth of the author’s research, others for their adroit summaries of complex themes. There is little doubt that Reformation Theology will ably serve the church and academy as a textbook for students and a reference work for scholars. It is already reshaping my own teaching on late-medieval and early-modern theology, and I commend it heartily. This delightful volume is a breath of fresh air in Reformation studies, putting theology back at the center. It shows with crystal clarity how the Reformers expounded the heart of the Christian faith, and why these evangelical doctrines still matter so much. This rich book takes up the challenge to think beyond 2017 and does so in a very stimulating manner. 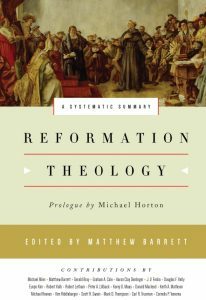 Each of the contributors is an expert in his field and knows that the Reformation is a highly relevant treasure for both the church and theology. They convincingly encourage the readers to think through this treasure and adopt it. Everyone eager not just to look back at five hundred years of reformation but also to look forward finds here the perfect material.